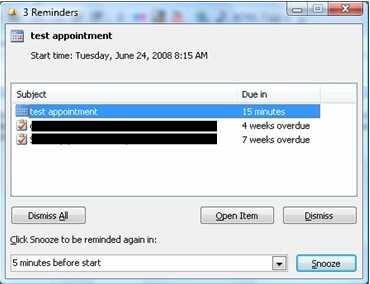 I usually set my appointment reminders in desktop Outlook to 15 minutes. 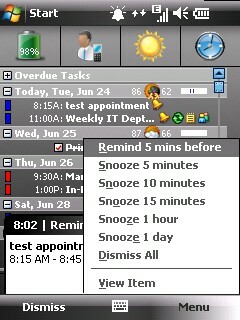 When the reminder pops up, the default option is to snooze the reminder to 5 minutes before the meeting. At the 5 minute mark by default you can snooze the reminder for the last 5 minutes. I find this to be a great feature and I automatically click the snooze button without having to worry about setting the snooze time frame. 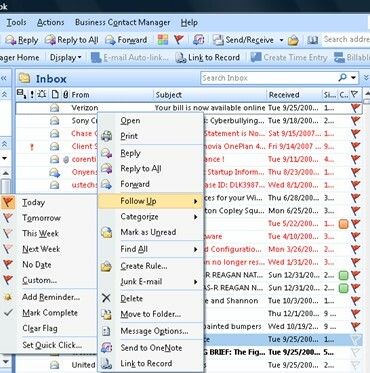 The Outlook reminder pop up with the default "5 minutes before start" option set for the snooze function. Up until to 6.1 this option was not available on Windows Mobile. A subtle addition which simplifies my life.